I just put the photos on the message. Sorry they are so small. Ill work on the Google thing. The second and sixth, is the "dramatic" setting? They seem well lit and show the passage much better the other settings. Cool! True that they are more lit but its some weird control setting and it tends to make all the highlights much too harsh, im not really a fan of it because its not true to the colors. 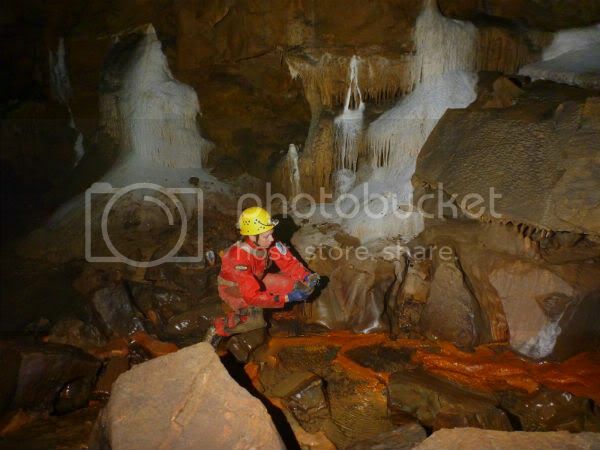 Like I said thats just the on camera flash and its not going to light up a black lava tube too well. Ill get my Vivitars out when i get some slaves. But the main thing is the noise is so much smaller than the old Tough, I wish I had it around still for comparison. Some nice shots there. Next trip, you could try adding a person for scale/interest in some of your shots. Looks like your new camera is working fine for you. With the Google thing, I agree it's annoying. But you should still be able to upload shots directly to Picasa and avoid Google+ entirely, right? I had a similar problem sharing documents and video clips through Google Docs recently. It still works, but because they are transitioning to Google Drive and Google+ some people are unable to access my links (even with privacy set to public). The workaround for that is to tell people to sign out of Google and Gmail before clicking the link, but unfortunately this doesn't work with your link. Oh, I wasnt trying to take nice photos or anything, thats why I wasnt worried about scale. Im just putting the new Tough model through the paces and seeing how it fares compared to the older models. If I still had an older one I could compare the sensors, which is what Olympus says has changed with the new model. Luckily theres tons of lava tubes around and I can stop in quickly and take some shots on the way back from Costco. I bought the Panasonic DMC-TS3 last Christmas and didn't like it at first. Once I started playing with it and learning what each "scene" did, it's turned out to be an excellent camera. I took the cave photography class offered by Peter Jones at the last convention and it was a HUGE help in learning to use the camera. I have a Pentax Optio WG-1. I was on a trip with someone who had a Lumix and we both had an external flash. We combined for a couple of multi-flash shots in a BIG stream passage. I was in a Fireworks mode. Not sure what she was doing. When we set the flashes off, I had just a little bit of light right in front of the flash, and the rest dark. She had a well-lit shot that stretched out in to the distance. I'm not a real camera buff, but I'd guess that the Lumix had a lower aperture on the lens and let much more light in. In passages that are more modest in size, the Optio does fine. I would say that also completely depends on what setting. Why did you choose the fireworks setting? On my Olympus Hg-1 there is a specific low light setting but I still find that manually adjusting the exposure compensation setting on manual will allow a better shot and I dont know about your camera but the special scene modes (fireworks, portrait, underwater) all lock most of the settings so you cant change the compensation, WB balance, flash modes, etc. On a trip to a very wet stream cave in Idaho I used my ElSpeleo as the main lighting element with supporting light from a Sten and got some nicely lit shots, and the best thing was when it got muddy I just washed it off in the stream, external lens and all, and continued shooting. I just wish my FireFly unit was waterproof! I'm impressed with the new line of waterproof compact cameras out there, they are allowing people to get some shots in places that would otherwise not be the worth the effort. And if you have lugged a 35mm manual film camera back in the day (or recently!) through a cave you' know what I'm talking about. These are great reviews. However, does anyone have comments on ease of use? I don't plan on studying cave photography (or even photography for that matter). Which cameras are good for point-and-shoot or select a pre-set setting, then point and shoot? I've been hunting for a camera too...here's my problem. I've been lightpainting larger areas with my current camera (a pile of garbage $15 pawnshop 12mp Kodak Easyshare Sport) and want to continue to have that ability. This silly camera, while taking horrid photos, has a nice setting allowing me to manually set the exposure time to 1, 2, 4, or 8 seconds. None of the newer cameras I look at seem to have this function. They have night, or fireworks settings. You can lightpaint with these, but the exposure length is up to the camera. I tried taking the same shot over and over on fireworks setting with my brothers Olympus Tough, and each time the exposure length was different. I want to be able to under or overlight the photo according to my wish and I want to know how much time I have to paint. What "tough" cameras will let me do this? Reading specs hasn't helped me so far, many say they have exposure lengths from blah to blah, but there's no way to manually control them. After a bunch of research, I found that the Panasonic Lumix models (at least the DMC-TS4) allow for manual manipulation of exposure and aperture. I got one for just under $200 and took it for a try. The results were not stunning, thanks to my ignorance, but the quality compared to my other camera is very encouraging. With practice, I think I'll be able to take decent photos with this one. The colors are good, it's easy to set the manual controls, and it has all of the useless bells and whistles (altimeter, barometer, compass, gps) one could ever expect from a cheap camera. I don't know about the video yet, but I'll find out soon. 1 - My wife in the most decorated cave in the county. This is the only one I tried with a long exposure. It was about 6 seconds I think and I had to steady the camera with a finger, likely introducing some wobble. 2 - Same. No flash. The lighting is a mess, but the colors are accurate. Do any of these cameras have a bulb setting or do they have the feature on the button that allows for a remote press? That is the one downfall of the Olympus TG-1, no bulb setting. I use firefly slaves and an IR filter over the onboard camera flash and use the two second delay to help with camera shake when attached to my Gorilla TriPod. Though I have found that my El Speleo light puts out enough light for most shots in passage but not in the big rooms and it also has a warmer light than the electronic flash. On a recent cave trip a friend used a Panasonic Lumix TS4. We had a large group but with the manual exposure setting we were able to paint the cave with light and the photos turned out pretty nice. He used a tripod to hold the camera and we covered our lights while he metered the camera. Back in November my Olympus TG-i 1 snuck out of my pocket and fell into a plunge pool while on rope during very high water in Mill Creek Crystal Cave in Montana. I couldn't retrieve it because of the waterfall thundering down on it so there it sat until this past Saturday in a turbulent snowmelt bath. A few members of the NRMG and the Bigfork High School Cave Club snowshoed the 6 miles to the cave for some survey and camera retrieval this past weekend. Waterfalls were but a trickle and here is an underwater shot of the camera as I found it. After I fished it out of the pool I looked it over for damage, found none, and pressed the power button. Presto! and it even had 2/3 battery charge left! I thought I would just get the card back at least but the camera was no worse for wear, and the cleanest its been since I bought it.